At about the same time the Belknap chairlift was being built, Harvey Dow Gibson, one of America’s leading financiers, had a vision of making his hometown, North Conway, New Hampshire, into a world-class ski resort. He had consulted with his friend, Averell Harriman, who had emphasized how important a good ski lift was. Gibson began building a ski area named Cranmore and retained a local mechanic, George Morton, to build a lift. Morton traveled down to Gilford to examine the new chairlift and felt he could do better. 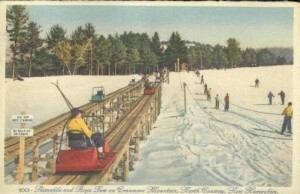 Morton came up with a lift that transported skiers in individual cars that “ascended a wooden trestle, pulled by a cable under the track.” (http://www.cranmore.com/winter/resorthistory) The cars were quite unique and required skiers to take off their skis, but Morton felt this was better than having their skis dangle from a chairlift. Gibson named the new lift the Skimobile. For more photos of the Skimobile check out http://teachski.com/pcindex2004/CranmoreNH.htm. Getting on or off the Skimobile was a matter of commitment. You handed your skis to the operator, stepped into the moving car, and then the operator handed you back your skis. Similarly getting off, you could hand your skis to the operator and then step off. If you were the sort of person who hesitated getting on or off an escalator, the Skimobile was not for you! Another feature the Skimobile offered versus a chairlift was unloading platforms at intervals along the lift. So if you didn’t want to go all the way to the end of the lift, you could get off along the way. These additional platforms were not attended so if you did decide to get off, you had to step off with your skis in hand. Stepping onto a snow-covered wooden platform in ski boots with your hands full of skis and poles was a little tricky. Those unloading platforms were also used by the ski school as a way of measuring your progress: as your level of skiing improved, you got to go further up the mountain. As a kid in the school program I quickly learned that status was equated to which platform you used. 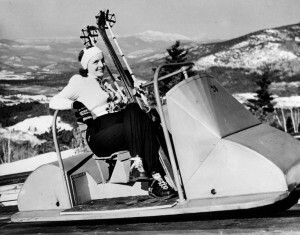 By modern standards the Skimobile was not a very efficient ski lift, but for its day it was faster than the chairlifts and the Skimobile proved to be a first class summer attraction. It was finally removed in 1988. This entry was posted in Columns. Bookmark the permalink. 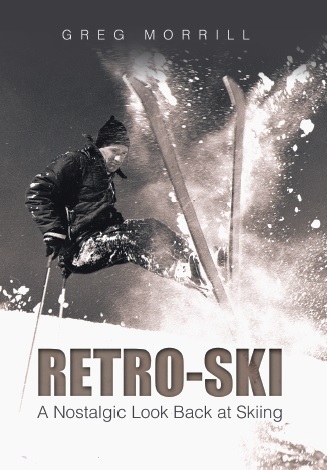 Feb. 1957: Movie of Cranmore Mountain Skiing scenes in the linked story below. The films includes scenes with Herbert Schneider and several of his ski instructiors: Otto, Squally, Eddie, and Virgil (?) – who taught the highest level of the ski school at the time. Includes a helicopter landing and taking off at the base of the mountain. roman on Rear-Entry Ski Boots: The Impossible Dream!